P.S. We're 30 – Buy tickets now! 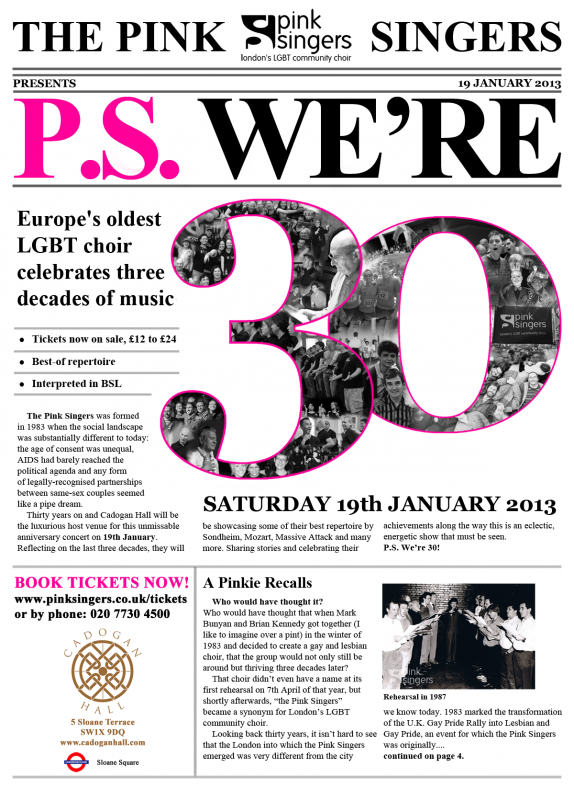 2013 sees the Pink Singers celebrating our 30th birthday! We begin our birthday year with a concert in the luxurious and atmospheric Cadogan Hall, Sloane Square on Saturday 19th January 2013. Join us for an evening of entertainment, featuring some of our best songs from the past three decades. We will be celebrating our journey in style with this unmissable event, showcasing some of our best numbers by Sondheim, Mozart, Karl Jenkins, Massive Attack and many more. So come along and wipe those January blues away as we pull out all the stops with an eclectic and energetic show of song, dance, comedy, and a few surprises along the way…after all, it’s not every year you turn 30!